Valley of the Kings - Under the New Kingdom, the pharaohs designated a desert valley west of their capitol, Thebes, to be their necropolis. It was a lot more practical than building a new pyramid each time a pharaoh died, and they must have figured their tombs would be more difficult to rob by not advertising them with great monuments. They were wrong, of course. By modern times, every royal tomb had been robbed...except one. In 1922, archaeologist, Howard Carter, discovered the resting place of Tutankhamun, the son of Akhenaten and a minor pharaoh. It was this fact that preserved his tomb from grave robbers. His reign was virtually lost to history. Thutmose I was the first pharaoh to be buried there and Ramses XI was likely the last, stretching almost the entire period of the New Kingdom. 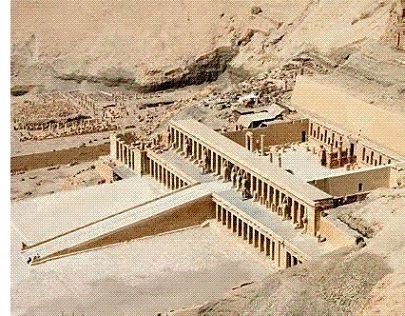 Hatshepsut, daughter of Thutmose I, built the most recognizable structure of the valley, the Mortuary Temple dedicated to Amon-Ra (pictured here).